All transactions are safe and secure with a reliable history in online purchasing behind each of our associates. 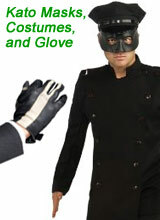 Buy the Kato Green Hornet Costume to own Bruce Lee clothing and merchandise. Fill the shoes of Bruce Lee with this Kato costume that let's you portray the part of The Green Hornet's legendary sidekick. Kato assists Britt Reid (alter ego of The Green Hornet) on his vigilante missions and otherwise functions as Reid's driver and bodyguard. Lee's role of Kato helped to popularize martial arts in America in the 1960s, and eventually led to his well-known mainstream movie roles. Browse Kato masks, gloves and full outfits that have been made popular again by the 2011 Green Hornet movie starring Seth Rogen and Jay Chou. In addition to the Kato Green Hornet Costume above, browse the Bruce Lee Clothing Gallery for more apparel like men's and women's clothes, kids shirts or hoodies.